When I travel I often try to prepare by looking for options I should check out in any area I’ll be visiting. When time allows, I look up Rare Bookstores, used or specialty book stores as well as unique stores or places I have in the past found to provide opportunity for unique treasures. Sometime I recall a place mentioned previously by a member here. I also often try to keep in mind if other members may reside nearby who I might be able to meet while passing through or those who can suggest the “Don’t miss” spots in any given location whether it be a fabulous diner, a special event, the best brewery, a flea-market that often yields significant items or a vista with a remarkable view. With that in mind I am starting this thread so those traveling may inquire of locals or others that have been there to share “WHERE TO GO”. I wanted to start this thread a few weeks back when traveling to Minneapolis (a neat city). We were staying downtown for a few days and only using public transportation however found a number of places to check out even without this thread. This is an interesting store with great potential, good staff and some signed King available on my visit. Very interesting store with piles in the isles. Lots of stuff to peruse through. Many old maganzines Fantasy and Science Fiction mags for as little as $3. You would need to spend time however may locate a great find. Attached to Uncle Hugo’s with similar stock of all sorts of mysteries. Very well organized with nice shelves full of books. Had a few King Limiteds at high prices. VERY proud of thier books. When I was leaving after admiring and discussing his King Stock ( all items I already had), he mentioned he would discount those in store prices significantly. Worth a visit. This was an interesting used book store in a huge basement location which appears to have potential as seems like gets a bit of turnover. Liked the racks of books displaying “just arrived”, Monday, Tuesday, Wednesday, etc. with table for each day. At least two in the area. I often find things at these stores. (Kind of hit or miss). I did not get to them as was traveling by public transportation and only wandered so far from downtown. Heading to Orlando FL in a couple weeks. ANY suggestions of places to go (other than the theme parks) ? Any Bookstores I should be visiting? Mainly mysteries and thrillers. They specialize in signed first editions and do a lot of signings throughout the year. Also have paperback backs as well. Staff is great, very friendly. Lots of used books in many genres, fiction and nonfiction. Again, a great staff. Lots of signed books. Also many genres covered as well. Used books and plenty of them. Not sure if this is still open as they had some financial issues in the last year, but great staff. Hope they can get through the tough times. There are also some Half Price Books in the valley. You can get lucky and find a treasure buried among the masses but mainly just used hardbacks and paperbacks. *EDIT: great thread idea by the way. I am always looking for stores to go to when I travel. While not many of you will get the chance to visit it, on Ramstein Air Base in Germany is a little used book store called BooksRMagic. I picked up a mint trade Drawing of the Three there, some UK editions, and a whole lotta Star Trek paperbacks. NICKELWISE has a used book shop here in Colorado. I hope he sees this thread & post info. He is always a pleasure to do business with! Good stuff for the Phoenix area, Joe. 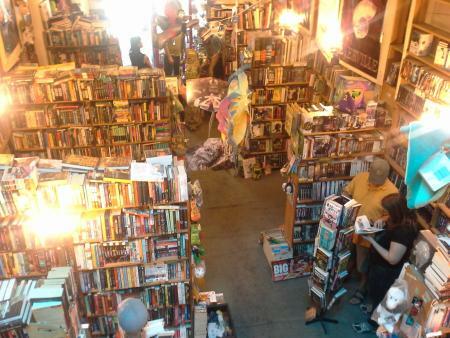 However you forgot "Bookman's" a MUST stop in for a peek as you just never know what they will have on hand, and cheap. The place is a book and media exchange almost like a pawn shop for books, records, etc. Also, I agree great idea for a thread, James!!! I'm heading to Portland soon and have Powell's on my list. Are there any other bookstores worth checking out? "I fancy it's the limitation to a thousand copies that is the chief charm and value of an edition deluxe. I don't expect to read this edition deluxe myself, although you needn't tell that to anybody else. Frankly, you know, I don't suppose that anybody ever reads an edition deluxe. No one puts bric-a-brac to any very practical purpose. There's some human instinct which makes a man treasure what he is not to make any use of, because everybody does not possess it. Don't know if I've been to a Bookmans yet. I'll have to find one close by. Of course, you just never know what will be on the shelves, but you just have to look!!! They are NOT collectors!! Thanks for the good words Lot Guy, but my bookstore is no more. My company is in the process of going under, and the retail part was taken over by someone else who didn't want books in the store, so I'm staring down the barrel of unemployment, and also have 30,000 books that I haven't figured out what to do with, though some will probably end up going on the Collectible Classifieds thread soon. Anybody recommend anything in Washington DC? I'll be there for 5 days, 2nd week of June. I will be in St. Louis in June. I've never had any luck finding any good book stores there. Any suggestions? The only Matheson I have that I know of (still have a lot of inventory to do) is a first Bantam paperback printing of Dark Forces signed by by Ray Bradbury, Joyce Carol Oates, Robert Bloch, Ramsey Campbell, Dennis Etchison, Richard Matheson, Richard Christian Matheson and Edward Bryant. I bought it in a lot and don't remember the story behind the signatures, but when I get a chance, I'll track it down and get you more information if you're interested. I'm sorry about your job, and hope it works out. But yea, books! I could think of worse things to do before leaving! And...think there are any other Bradburys...? Went to these two when I was there last summer. This one was cool. An old store with filled to the ceiling with books. I have a love/hate of places like that picture. I love them because you never know what you will find. I hate them because they are so disorganized and often books are treated poorly. It is pretty well organized actually, but I do agree with you. Well that is just awesome! Thanks for sharing! By the way, as a side note, if you come to Charleston, South Carolina, don't waste time looking for books. Go sit on a veranda, sip a mint julep, and have some BBQ. I buy all my books online (except for the occasional freak find at a thrift store). Thanks Joe, that's great info. I will def stop in at Capitol Hill books. I'll instruct my colleagues to send a search party if i'm not back before midnight! Graven Images: The Best Of Horror, Fantasy And Science Fiction Film Art From The Collection Of Ronald V. Borst, Introduction By Stephen King. Borst, Ronald (Editor). Grove Press. First Edition, signed by Forrest J. Ackerman, Robert Bloch, Ray Bradbury, Ronald V. Borst, Keith Burns, Leith Adams. The seller I bought it from on Ebay said he acquired all the signatures personally at various conventions. I believe I also have some other Bradbury paperbacks from the 50s-70s, most aren't in great condition, or particularly valuable. In case I've given the wrong impression about my inventory, the vast majority of the books I have are standard used book store or thrift store fare. Maybe 1,000 or so are worth more than a couple bucks, but as I go through them I'm always finding a few that are worth a bit more like a signed Vanna White biography, a 1939 movie tie in of Gone With The Wind, a 1939 printing of Mein Kamph. And to be clear, the above two books I mentioned, and anything King related, horror related or signed that I list will have been bought specifically for my personal collection, either from the publisher, Ebay, or another third party seller. If in the San Francisco Bay Area, go to Dark Carnival in Berkeley. Very quirky place.